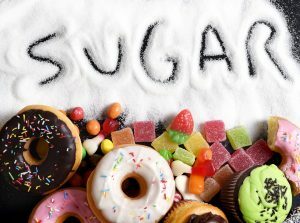 Sugar metabolism is the process of breaking down the foods we eat into fuel the body’s cells need to grow and function. Ingestion of pure sugar, or high-glycemic foods that are rapidly converted to sugar, causes a spike in insulin levels. Over time, insulin resistance and changes in blood sugar control may occur. As the body’s largest organ, the skin can be negatively affected – in a visible way – both by higher sugar levels and increased insulin concentrations. Hormones play an integral role in acne formation – especially adult acne. Elevated insulin concentrations have been shown to stimulate oil gland formation, increase oil production, and raise androgen levels – all factors that lead to more breakouts… and potentially increase growth of unwanted hair. This is all in addition to the added inflammation known to be caused by the effects of sugar on the body’s immune system. Along with skin tags, dark, velvety plaques on the neck or in the body folds are commonly seen in patients with insulin resistance. While the mechanism of action is unknown, the presence of acanthosis nigricans or multiple skin tags may be the first sign of pre-diabetes. 1. Opt for complex carbohydrates with a lower glycemic index over simple carbohydrates with a high glycemic index. Complex carbohydrates are broken down into sugars at a slower rate and do not cause spikes in blood sugar and insulin levels. 2. How food is prepared matters! Roasting, grilling, or frying starches in high heat increases the glycemic index through a process called gelatinization. Choose boiling or steaming when possible. 3. Order is important! Eating protein and vegetables before carbohydrates leads to lower post-meal glucose levels and insulin spikes.